Heading back into the work week on Monday leaves most of us trudging along mourning the end of the weekend. However, the beginning of the week is actually a great time to recommit to staying fit, albeit sometimes gaining momentum on a Monday is hard to come by. When the snooze button or the couch after a long day is calling your name, it’s easy to think of a million excuses not to sweat it out at the start of the week. But by making Monday workouts a priority, you’ll be rewarded in more ways than one. Here’s why it will be worth it. This one may go without saying, but exercising on Mondays can get the ball rolling for your weekly workout routine. There’s just something about getting your Monday workout in that helps set the tone for rest of the week. Some Mondays it will take some willpower to follow through with your workout, but exercise is actually a great way to harness more discipline for other areas of your life. Why? Exercise releases GABA, a neurotransmitter that helps keep you in control of impulses and can quiet anxious brain activity. Physical exercise has the potential to increase levels of BDNF, brain-derived neurotropic factor, which is shown to help build healthier nerve cells. In turn helping you ace a presentation you may have this week. Working in a sweat session before you put your nose to the grindstone can also help you absorb new concepts faster, too. Who wouldn’t want a quicker brain? Research shows that the average office worker doesn’t crack a smile until 11:16 a.m. But by adding physical exercise into your day, you’ll release endorphins; the hormones that make you feel happier. Resistance exercise can help reboot your circadian rhythm, the internal body clock that controls your sleep cycle. So if you’re looking to be able to catch a few more minutes of sleep, exercise may just do the trick. If these aren’t reason enough, there’s an entire community at the Y you can celebrate with about leading a healthier life, even on Monday’s. Which is why we’re joining the Motivation Monday movement and sharing what motivates us to start our week off right. 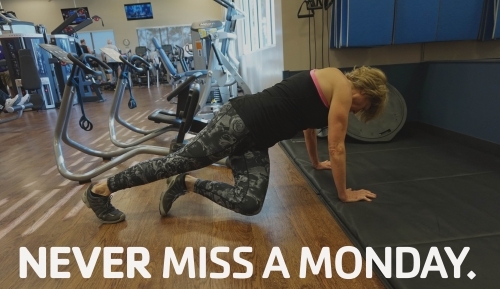 From group classes and small group personal training to our members motivated enough to put themselves through one on one training with our amazing personal trainers, we’ll show you how we’re staying motivated and ask what you do to #nevermissamonday. Check out our Facebook Page each Monday for a little motivation, and share with us what motivates you!